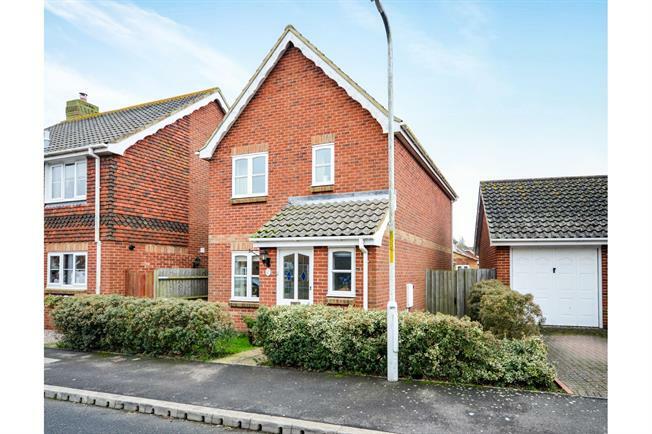 3 Bedroom Detached House For Sale in Romney Marsh for Asking Price £275,000. Three bedroom detached family home with two reception rooms, garage and off road parking. The entrance hall has doors to lounge and cloakroom which has low level WC and wash hand basin. The lounge has the stairs leading to the first floor. Dining room with patio doors opening on the rear garden. Kitchen overlooking the garden with range of wall and base units with sink set in work top, gas hob with extractor fan over, electric oven, dishwasher, spaces for fridge/freezer and washing machine, wall mounted gas boiler. First floor landing with airing cupboard. Master bedroom with built in wardrobes. Two further bedrooms. Family bathroom comprising a white suite with panelled bath and shower attachment, wash hand basin, WC and tiled splash backs. To the front of the house is off road parking leading to the garage with up and over door and personal door to rear. Enclosed rear garden mainly laid to lawn with patio and fenced surrounds.